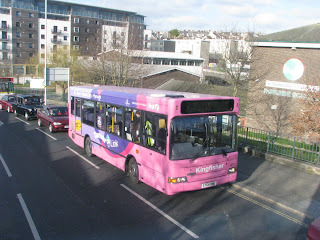 Torpoint's Dennis Dart S764 RNE (40002) has seen a fair bit of use in Plymouth over the last week or so. She went in for an MOT though spent a day on 6s and then a few days on the 3! These routes are usually run by either a Dennis Dart SLF or Volvo B6 so was quite a change to see her on these. This again very likely caused confusion for passengers with the wrong branded buses turning up. But not to worry she's back in Torpoint now, just for a change. Picture shows her on the 3 though the blind shows nothing because of shutter speeds.